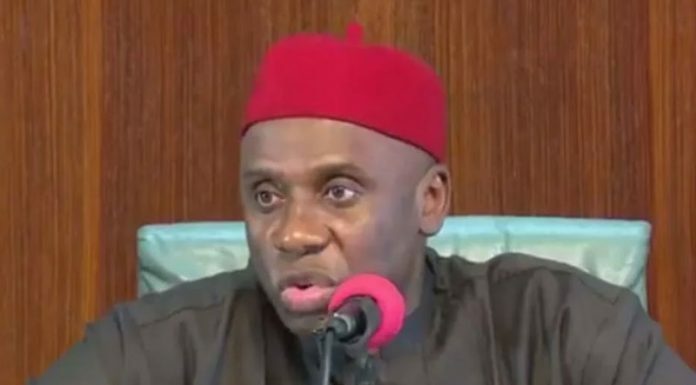 The Minister of Transportation and Director-General of the President Muhammadu Buhari 2019 Presidential Campaign Organisation, Mr. Rotimi Amaechi, has said that the Peoples Democratic Party is not offering the country any better alternative in governance. Amaechi who was guest on The Morning Show of ARISE News TV, a THISDAY sister company, said the All Progressives Congress-led administration of President Muhammadu Buhari had shown transparency, honesty and integrity in handling of the affairs of governance. Amaechi also said that the administration had shown enough commitment in delivering on promises in the area of security, infrastructure and economic stabilisation. Explaining why Nigerians have not seen much in terms of infrastructure, especially roads, despite claims by the administration that it is spending huge amount of money on the sector, Amaechi said weather and other natural factors had delayed work in most of the sites. He said there were ongoing construction work in most parts of the country. Meanwhile, APC has responded to the endorsement of Atiku by some Igbo leaders. APC said it considered Atiku and his PDP co-travellers as people who had lost any sense of shame. In a statement issued by the APC National Publicity Secretary, Lanre Isa-Onilu, the party described the endorsement of Atiku and PDP by some leaders of the South East for the 2019 general elections as an affront on the Igbo people who were frontline victims of the 16 years of the PDP misrule. â€œIt will be interesting to know what the PDP will be telling the Igbo people during the campaign. The South East people have three and half years of visible progress in terms of massive infrastructure and the thousands of common people who are benefiting from the social programme investments under APC compare to the PDPâ€™s 16 years of retrogression,â€ it said. APC said that it was confident that the Igbo people â€œwill not be fooled by any group, by whatever name, to sell a thoroughly discredited party like the PDP to the very discerning Igbo peopleâ€.